Mysuru: City advocates, who had staged protests on Jan. 22 and 23 in front of Mahatma Gandhi’s bust opposite City Law Courts Complex and in front of Nazarbad Police Station over the alleged assault by Nazarbad Sub-Inspector on advocate and BJP Youth Wing President Gokul Govardhan on Sunday, intensified their protest on the third day today. The advocates, under the banner of Mysuru Bar Association, who held a meeting at about 10.30 am at the Bar Association office in the Court premises, decided to continue the protest today. They boycotted Court’s proceedings and formed a human chain around the bust of Mahatma Gandhi at about 11.15 am to register their protest. They demanded immediate suspension of Nazarbad S-I Yellalingappa. Advocates, numbering more than 500, took out a protest march passing through Vani Vilasa Road, RTO Circle and JLB Road to reach Ramaswamy Circle where they again formed a human chain thus blocking the roads leading towards RTO Circle, Railway Station, Saraswathipuram and Chamaraja Double Road. Traffic came to a grinding halt on these roads. The agitating advocates shouted slogans against the Police and urged Chief Minister Siddharamaiah, who is in city to arrive at the spot and hear their grievances. Mysuru Bar Association President Ramamurthy, speaking to the media said that out of their two demands, their first demand of filing a FIR has been fulfilled but the second demand to suspend Nazarbad SI Yellalingappa is yet to be fulfilled. Stating the Police officials were only delaying the process, he said that they would continue their protest till the other demand is met. Association Secretary Suresh, who also spoke said that their demand to suspend Nazarbad SI Yellalingappa is not fulfilled and added that if the Police officials continue to delay the suspension of the SI, he warned of seeking support from all advocates in the State and launch a State-wide agitation. 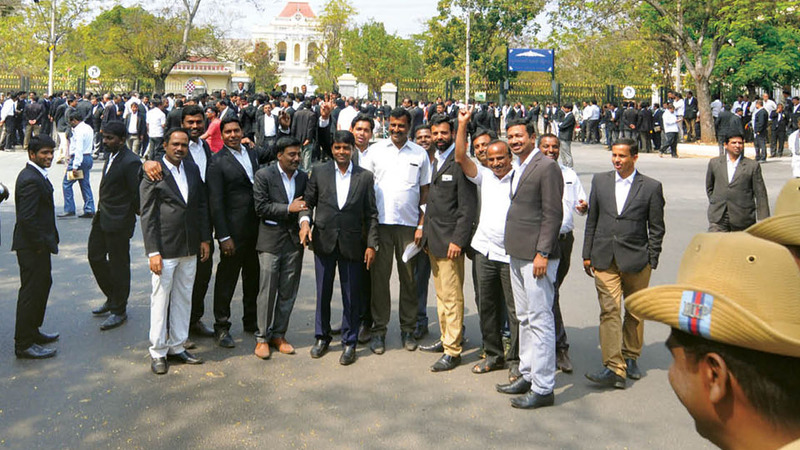 Stating that advocates from Mandya and Chamarajanagar were arriving in city to take part in the agitation, Suresh said that the Bar Association would seek support from students and staff of all Law Colleges in the State and intensify their agitation.